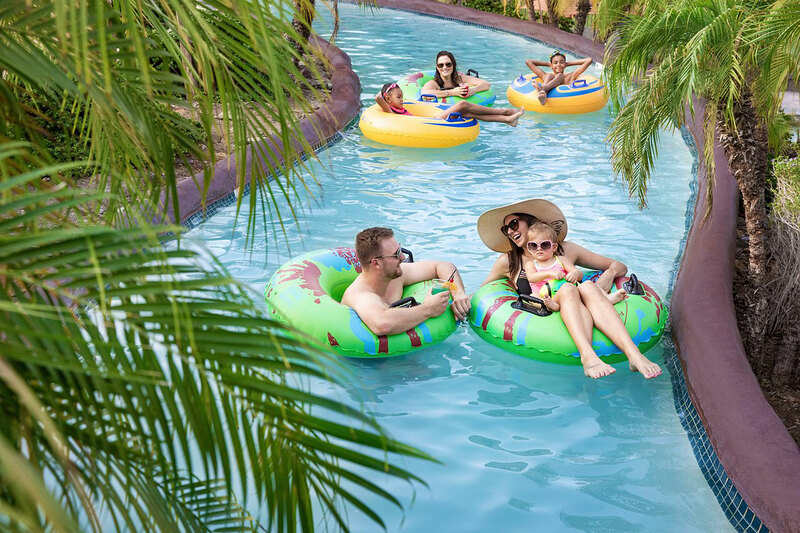 If your crew is a bunch of waterslide-wild, lazy river-loving sprinkle splashers, we’ve got some epic vacation ideas for you! 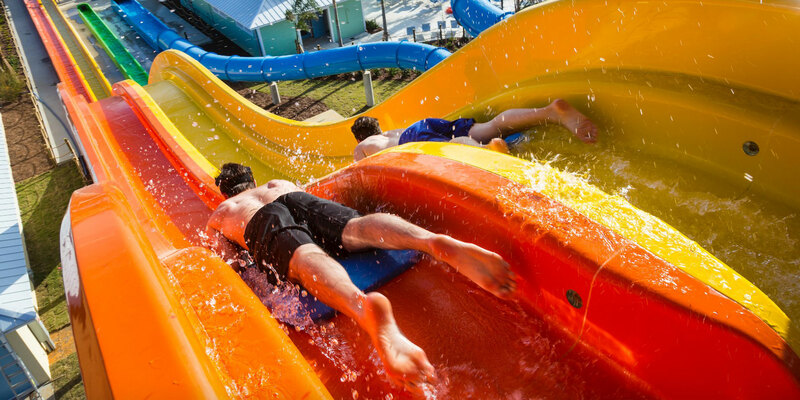 Here are nine of the top resorts with outdoor water parks in the U.S. Take advantage of sunny days and have a splash-tastic vacay! A Family Vacation Critic Favorite Hotel, King’s Pointe Resort features two water parks, indoor and outdoor. Soak in the sunshine swishing down five thrilling waterslides, jumping on lily pads or wading in the zero-depth entry pool. Plunge down a raft ride, wind through a flume slide, swoosh through a splashbowl and race down dual speed slides. The kiddie castle is super cool, and there’s a spray island and basketball too—enough to keep kids small to tall entertained most of the day! Afterwards, relax in a two-story cottage with private patio and sunset views of Storm Lake. 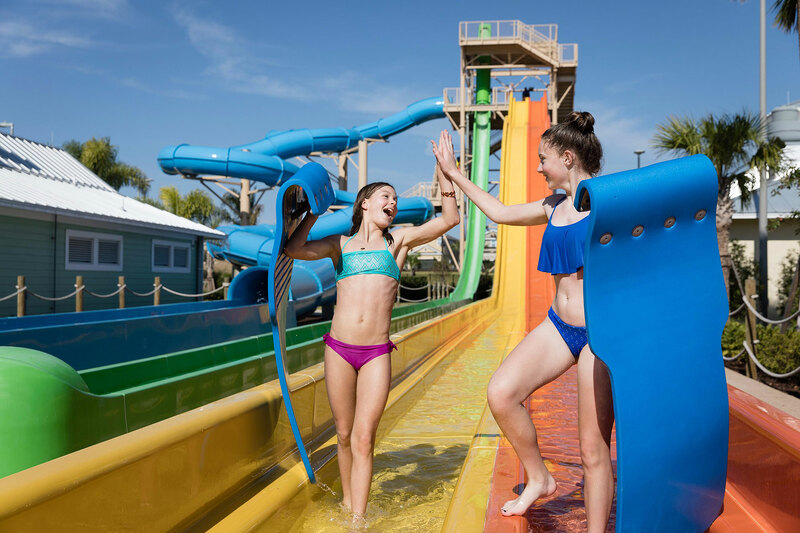 Four stories of oceanfront water park can be enjoyed year-round at Crown Reef Beach Resort and Water Park because they seasonally enclose the fun. Shoot through the world’s first hotel Explosion waterslide or enjoy the longest oceanfront resort lazy river in Myrtle Beach. Two giant outdoor pools, whirlpools, slides and a kids’ play area make for tons of water fun. A poolside bar, onsite dining and coin-less arcade mean you’ll almost never want to leave! 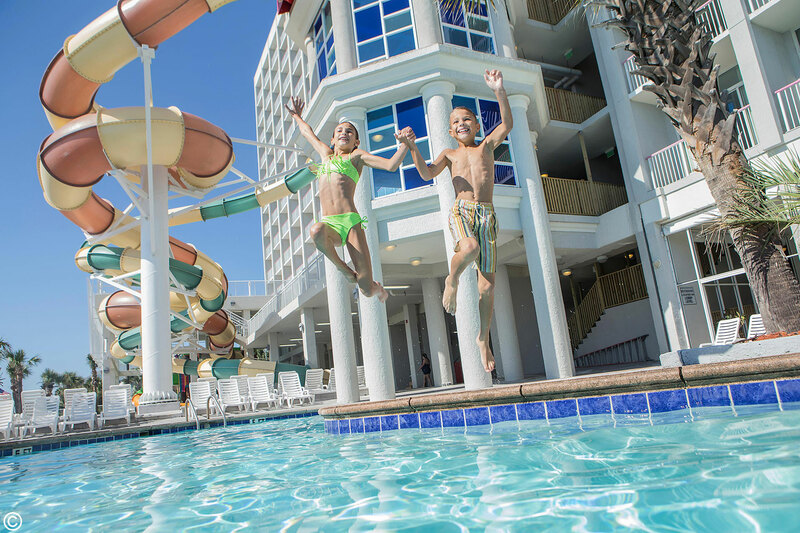 Theme-park loving families will enjoy the hotel-like services and amenities at Encore Resort at Reunion’s vacation home community just a few miles outside of Orlando. The Aqua Park is awesome, with 10 acres of wild water recreation. Giggles immediately ensue on the racing waterslides. Brave riders get all the bragging rights for dropping 60 feet straight down the Stormchaser. The tube slide and splash area with water cannons are great for younger kids. There’s a huge swimming pool, as well as poolside food and drinks. You can even rent a cabana or cool off in the arcade. The resort features amazing vacation homes, most with their own private pools, sport courts and so much more. 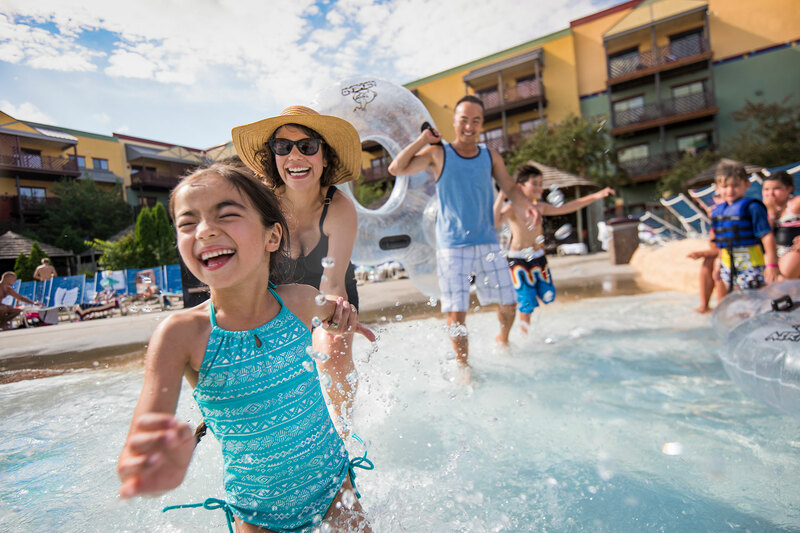 A visit to the Valley of the Sun can be especially refreshing when you spend your days at the River Ranch 9-acre water park at Pointe Hilton Squaw Peak Resort. This all-suite resort at the base of the Phoenix Mountain Reserve is fabulous for families. The kids will get a kick out of the half-mile lazy river, 130-foot waterslide and swimming pools with waterfalls. There’s also a kid’s camp so children can play while parents play golf and decompress at the spa. Mini-golf and onsite restaurants round out a relaxing, family-friendly resort with lush, landscaped grounds and dramatic mountain views. 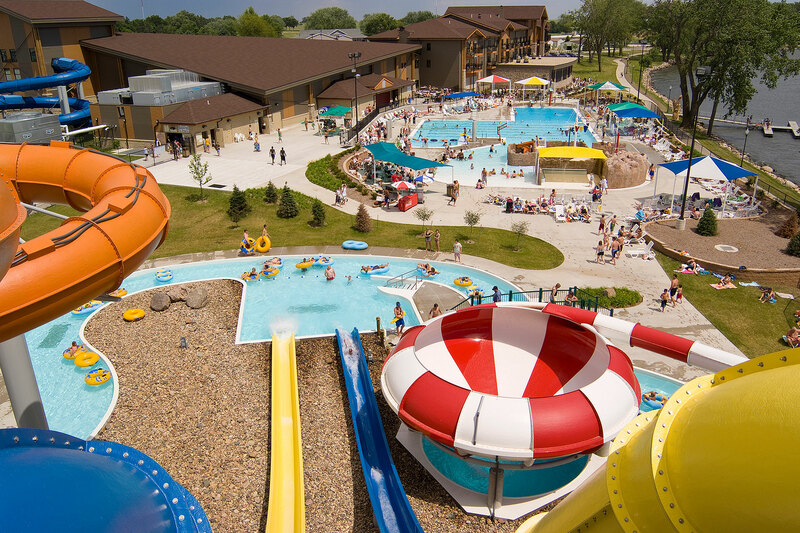 If you’re headed to the “Waterpark Capital of the World,” you can expect lots of fabulous places to splash the day away. 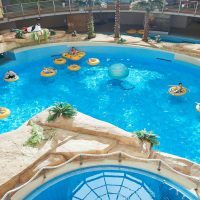 However, Kalahari Resorts & Conventions Wisconsin Dells, with its beautiful African safari decor, indoor theme park and sensational Zambezi Outdoor Water park, holds a special place in our hearts. There are bungalows and hot tubs for those looking to chill. The lazy river and multi-level tree fort are low-key fun for the kids. Extreme thrills, like The Smoke that Thunders and the Extreme Rush, the only slalom waterslides in the Dells, make sure even the biggest daredevils are pleased. 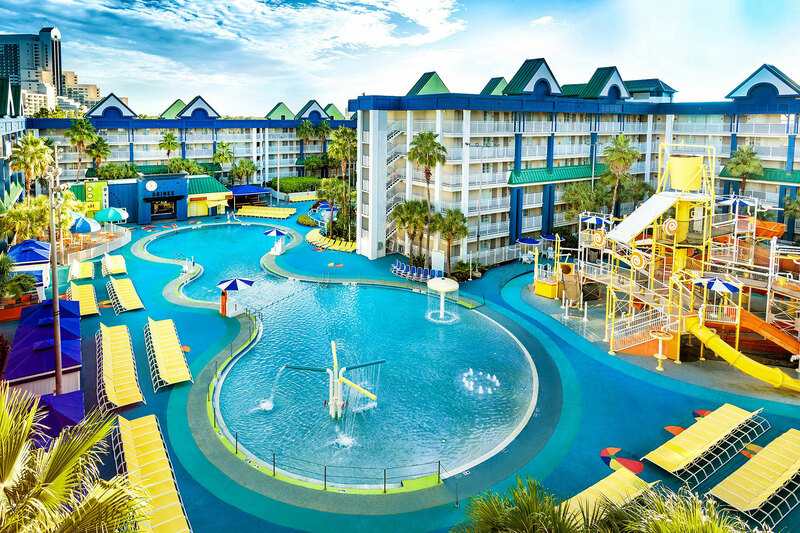 The Holiday Inn Resort Orlando Suites Waterpark features two water parks with huge pools, slides and splash features. Plus, there’s an arcade, 4D movie theater, laser challenge and free shuttles to the parks. All suites include kitchenettes and kids under 11 eat free for breakfast and dinner. The water parks include poolside entertainment, cozy cabanas and a poolside bar. What a great way to cool off after time at the theme parks! 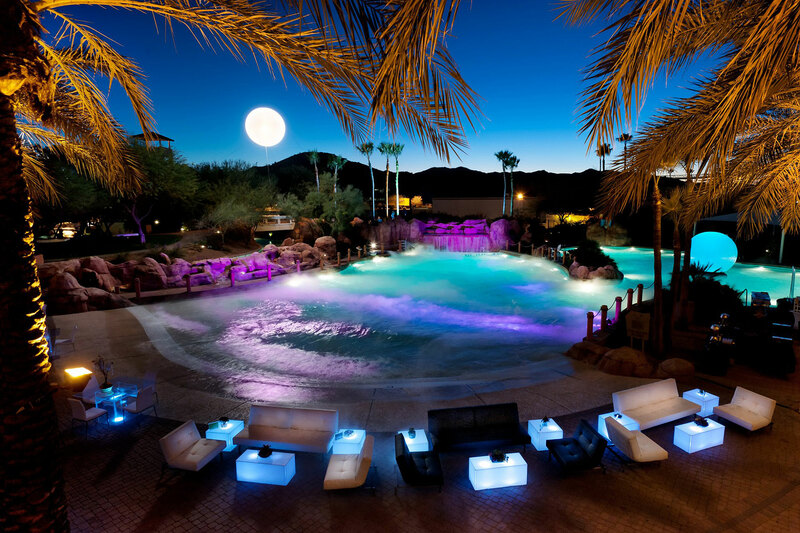 The Oasis Water Park at the Arizona Grand Resort & Spa offers 7 acres of aquatic attractions. The slides, lazy river, wave pool and water volleyball make for perfect ways to enjoy the desert sun. You’ll have a hard time pulling little kids away from the water spray area. For those wanting to get their heart pounding, the eight-story thrill slides are just the ticket. Located two hours southeast of Walt Disney World, Disney’s Vero Beach Resort is on the Treasure Coast, where blue waters lap up on the beaches and time seems to slow down. The Mickey Mouse-shaped swimming pool features a pirate-themed wet play area. 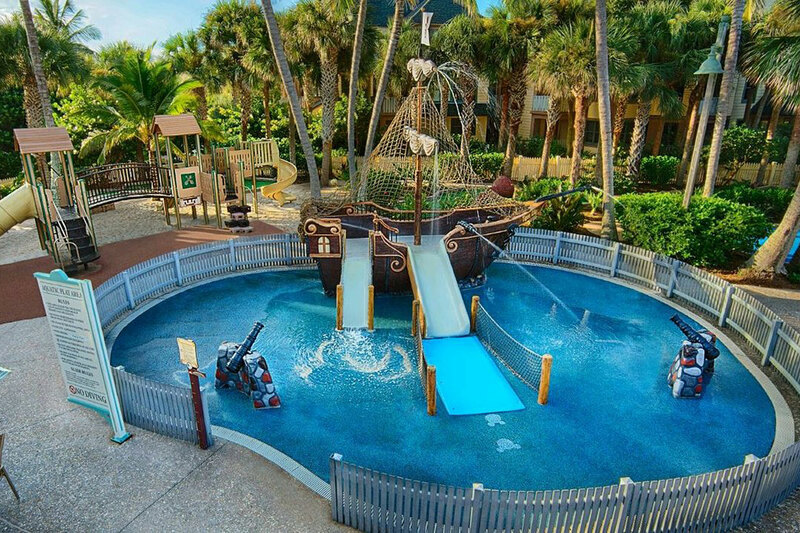 Plunge down the two-story slide or shoot water cannons at other buccaneers. The kids will love the water park as much as they do the Disney Discovery Club supervised children’s activities. A family vacation at the Hyatt Regency Maui Resort and Spa is pure paradise, with endless family-friendly activities at your doorstep. The six pools at this resort are on the edge of the Pacific Ocean and surrounded by lush tropical plants and flowing waterfalls. 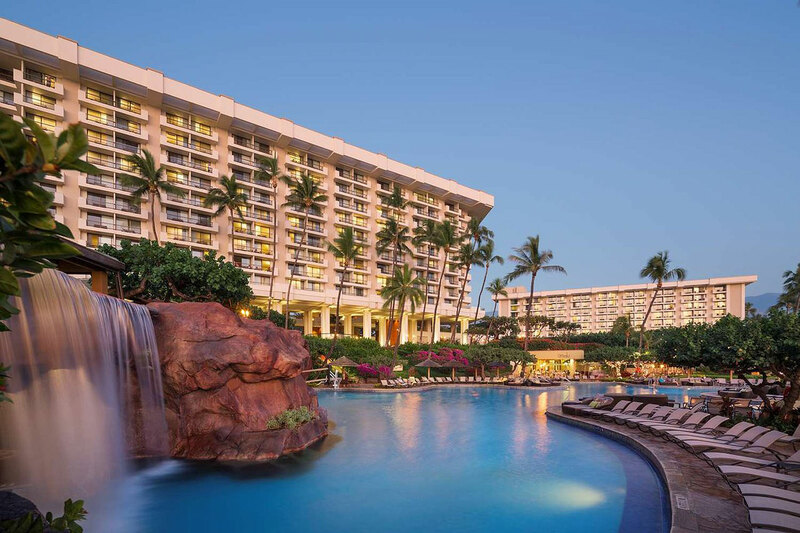 Swoosh down the 150-foot lava tube waterslide, balance on the rope bridge or watch your cares melt away in the whirlpool. The interactive children’s pool will keep the little ones busy while you sip a cocktail in a fresh pineapple. Cortney Fries (pronounced “freeze” is an award-winning Chicago-based writer and mom to two spunky elementary school-age kids. She loves nothing more than traveling with her husband and kids, having adventures with friends and exploring the gorgeous outdoors. Cortney believes that you should definitely do things that scare you just a little bit. Follow her on Instagram, @cortneyfries.